For this month's challenge, we're challenge all of you to show us how you're THANKFUL! and since my American neighbours are celebrating their Thanksgiving, it's the perfect challenge! To show how I'm thankful, I've decided to use BASKET OF LOVE BUN! 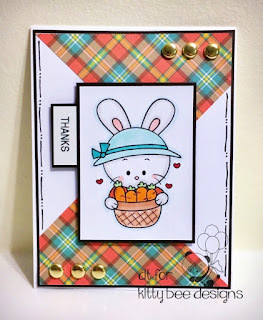 For this card I used Lawn Fawn 6x6 petite paper pack called: perfectly plaid fall, Michael's Crafts 110lb white card stock, copic markers, clear wink of stella, recollections large gold brads and I used my brother label maker for the sentiment. So, if you love this digital image as much as I do, please head over to the Kitty Bee Designs Etsy shop to grab this adorable bunny, OR click HERE to join our challenge and win her for FREE!